Are you looking for a garage clean out Fort Lauderdale services provider? If your answer is yes, Evergreen Junk Removal Service provide garage clean outs for home owners. Contact us today for a FREE estimate and let our professional team come do the garage clean out services for you. Allow us to clear out your garage in order for you to park your car or better utilize the garage space in Fort Lauderdale or near surrounding area..
Let us do the garage clean out for you. Garage clean out Fort Lauderdale service, junk pickup, house cleanout, deck removal, furniture removal, garage junk disposal, rubbish removal. Call us! 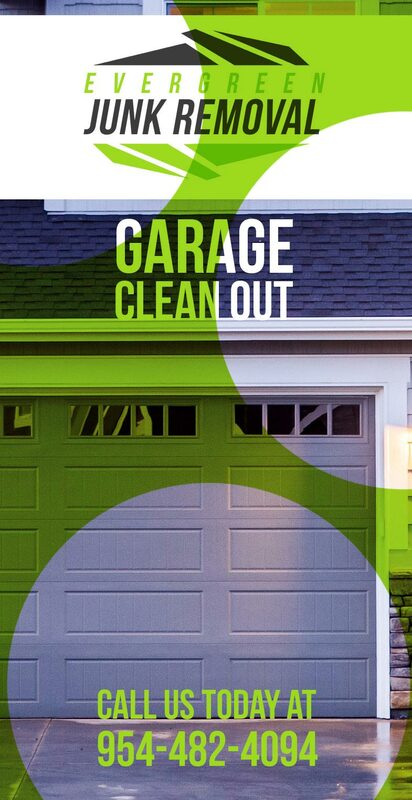 Garage Clean Out Services - Clear Clutter out of your Garage! Do you have an overly cluttered garage? Find yourself always having to park outside because there’s no space in your garage? It may be time to consider having your garage cleared. Wondering if there’s a company that actually specializes in garage clear-outs? The answer is yes! At Evergreen Junk Removal, we are your go-to company when you think about removing your unwanted items or junk. Our crew takes care of the loading, lifting and hauling – saving you time and stress. Looking to have items within your garage cleared? Contact us today for your free garage clear-out quote. Why hire a Garage Clean-out Service? We understand! You’ve had some items for a while that needs to be removed; however the time never permits for you to do it on your own. A garage clear-out service is a huge convenience, especially to those with busy schedules. By choosing our services, we can help you towards your goal of de-cluttering the space. Do you feel restricted within your own home? Wishing you could pull your car freely into your garage? Let us help you! We get rid of all the items you no longer need or would like to donate to create space. Say goodbye to restrictions! Ask you about our full garage clear-out rates! There’s nothing more frustrating than not being able to use your home to its fullest potential. Have you ever thought about transforming your garage into a spare room or office? Make it a reality! Once you clear your garage space, the possibilities can be infinite. If you’ve lived within your home for 10 years or more, it can be quite easy to collect items over the years. You may have had items sitting in your garage that you have either forgotten about or no longer have use for. It happens! There are always great ways that you can put those items to use. Recycling for one, second donating to charitable organizations. We take pride in our recycling and donation efforts. Choosing our services allows you to clear your space while contributing to a greater cause. Interested in having your garage cleared soon? We offer same-day services. Our team is experienced in not only garage clean outs but also in estate clean outs, attic clean outs and more. We have hauling specific trucks and dumpsters that can fit any size of clean out job. The benefit of Evergreen Junk Removal Service’s stress-free clean out. What are some alternatives to hiring a Garage Clean Out Fort Lauderdale Company? Things to consider when hiring a Garage Clean-out Company in Fort Lauderdale? Ask if items will be donated: If items within your garage are in good condition, more than likely it can either be recycled or donated. Feel free to ask this question. Things to consider when hiring a Garage Clean Out Company? With years of experience and knowledge, Evergreen Junk Removal is the premier company for all your junk removal needs. Our team is both fully insured and trained to handle all situations. Are you in Fort Lauderdale or surrounding areas? We are ready to help! Contact us today. We provide you with an update from John & Kim move a price based on the volume, Labor, travel, transportation, and weight of what you need to be removed. Why do People Need their Garage Cleared-out? If your garage is cluttered, you can benefit from our services. Clutter within your garage can cause both health and safety hazards in the event of an emergency. Moreover, who doesn’t like an organized garage? You can count on Evergreen Junk Removal for your garage clear-out needs.